Quora’s priorities are growth, hosting a wider range of questions, and mobile — which is now 25% of its traffic. So to attract people who need quick answers, especially on the go, it is starting to show the online status of the experts it recommends you ask. It could keep that “live” feeling that Quora already offers, and pull quick decision questions about topics like shopping or cooking away from Facebook and Twitter. 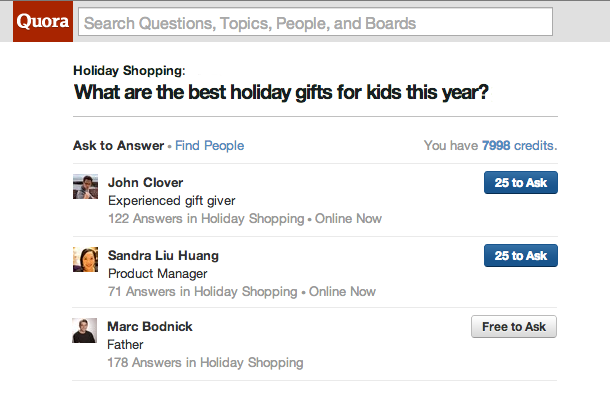 Quora has long given suggestions of who to direct your questions to based on the tags you add. Now when possible, its top suggestions will be experts who are “online now,” meaning they have the site or app open. By asking these people who are actually available, you’re a lot more likely to get a quick response. That will be great for urgent questions about what product to buy, parenting, scary medical issues, and definitely cooking and movies — two of Quora’s most popular categories, according to manager Marc Bodnick. If you’re trying to figure out what to make for dinner or which of two films to go see, an answer a week later won’t help. “Online Now” will get you opinions and answers in time to make a decision. Bodnick says “We were seeing a ton of time-sensitive questions on the site, and noticed a lot of them came from mobile devices.” Now you could be standing in the movie theater lobby, ask film buffs who are online what you should see, and get an answer by the time you’ve bought your popcorn. As before, you can ask questions as often as you like to people who follow you, though it will cost the free currency Credits you earn through engagement on the site to ask strangers. For privacy’s sake, Quora lets you opt out of showing your online status, and when people ask questions is the only time they’ll see if you’re “Online Now.” It also won’t start showing your online status until you’ve seen the home page prompt announcing the feature. Finally, those with privacy concerns who opted out of its controversial “views” feature that shows what you’ve looked at are opted out by default. Previously, Quora has felt more like the home of in-depth, serious, evergreen questions that took a while to circulate to the right expert. “Online Now” will help bring in more off-the-cuff, urgent questions that people ask on Twitter and Facebook because of their more real-time nature. Sucking traffic away from the social networks would be great for Quora, which hasn’t successfully attained widespread awareness and use like fellow knowledge base Wikipedia. The product might also encourage enthusiasm after co-founder Charlie Cheever stepped away from daily work at the startup. This product isn’t going to make money for Quora, though. Bodnick says “We agree the monetization options are going to be exciting but right now we’re focused on product, growth and diversity.” All the big companies seem fixated on the shift to mobile, so for a company’s whose mission is to share and grow the world’s knowledge, making itself more relevant on the small screen seems pretty smart.